Scroll down to see all of the murals. 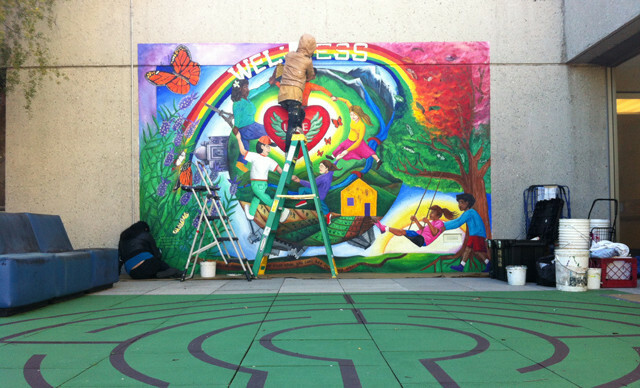 For the past few weeks, the staff and patients of the Psychiatric Ward on the 7th floor of San Francisco General Hospital have watched the gray concrete walls of the patio transformed into three brightly colored murals – Recovery, Wellness and Health. Precita Eyes founder Susan Cervantes and her crew of artists and volunteers finished up their work this week. The three murals, commissioned by the General Hospital Heart Foundation, replaced more faded ones and depict a common goal. The “Recovery” mural, for example, features a man flying a red kite in the shape of a Phoenix that rises to recovery. It also portrays a group of people drumming and playing soccer under a yellow sun. “This one catches my attention because there are people drumming around,” said Hugo Calderón, a counselor who has been working at the Psychiatric Ward since April of last year. He helps outpatients get ready to go into the workforce. The “Wellness” mural stars a radiant red heart inscribed with the word love. Around it, a family and butterflies dance and flit. Two children play by a tree. Buildings dedicated to love, such as the Taj Mahal and the Eiffel Tower surround the family, which sits beneath a rainbow. “It’s nice not to just have concrete walls, its nice to have color in a locked facility,” he said. Cervantes’ son Suaro who is one of the artists helping out with the murals, says that this facility has a special meaning to him because two of his good friends spent some time here. He’s glad to add color to the walls, which share the patio space with a garden, a green maze drawn on the floor, a basketball hoop, a couple of tables and some comfy heavy duty chairs set in a circle for drumming activities. “If they [staff and patients] get excited and want to plan something, we are up for it,” said Cervantes when asked if there would be some kind of celebration to welcome the murals into the 7th floor community. The planning for the mural began last October with staff and patients actively involved in the process. 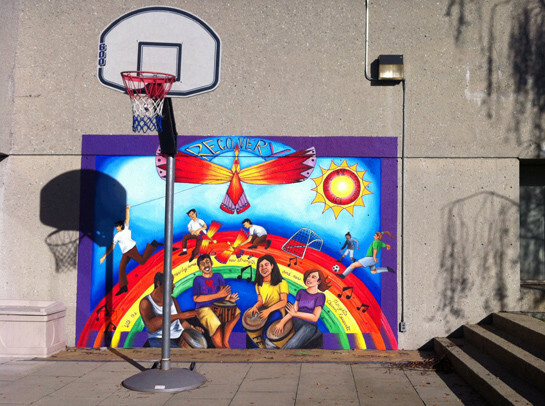 They participated in workshops to develop the ideas and themes that the mural would ultimately include. Some patients seemed responsive to having their ideas represented in the murals, others were a bit shy, said Cervantes. With everyone’s input the team decided on three themes: Recovery, Wellness and Health or essentially what the staff and patients are working together to achieve.The team also decided on three revolving elements: the Earth, Sky and Water. With these foundations, the staff and the artists determined the murals’ final composition. Each mural has uplifting quotes from people like Eleanor Roosevelt and Martin Luther King and the three theme words are displayed in several languages. “It speaks to everyone,” said Calderón. Cervantes says the process of making the murals is also meant to be therapeutic. Every Tuesday, during that recreational time, patients could work one-on-one with the artist and volunteers. “I think of art as healing. It’s more transformative than anything and changes people’s lives,” said Cervantes. 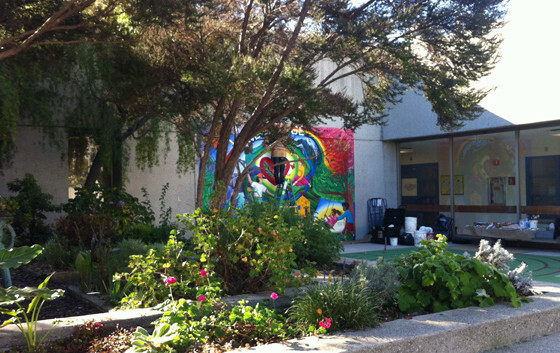 Another view of the Wellness mural, next to the garden in the patio. 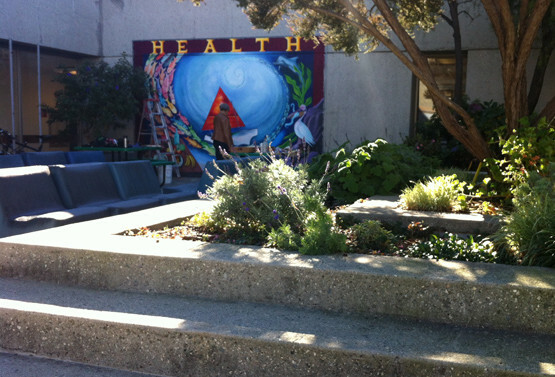 The Health mural, also on one side of the garden in the patio. PreviousGood Morning Mission – All you need!